This work is a retrospective analysis to investigate the critical risk factor for the therapeutic effect of endoscopic keel placement on anterior glottic web. Altogether, 36 patients with anterior glottic web undergoing endoscopic lysis and silicone keel placement were enrolled. 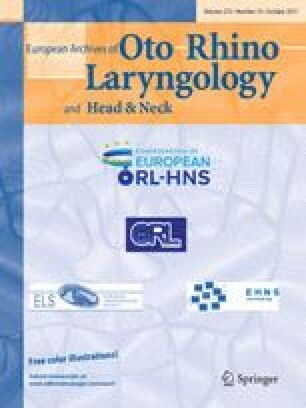 Their voice qualities were evaluated using the voice handicap index-10 (VHI-10) questionnaire, and improved significantly 3 months after surgery (21.53 ± 3.89 vs 9.81 ± 6.68, P < 0.0001). However, 10 (27.8%) cases had web recurrence during the at least 1-year follow-up. Therefore, patients were classified according to the Cohen classification or web thickness, and the recurrence rates were compared. The distribution of recurrence rates for Cohen type 1 ~ 4 were 28.6, 16.7, 33.3, and 40%, respectively. The difference was not statistically significant (P = 0.461). When classified by web thickness, only 2 of 27 (7.41%) thin type cases relapsed whereas 8 of 9 (88.9%) cases in the thick group reformed webs (P < 0.001). These results suggest that the therapeutic outcome of endoscopic keel placement mostly depends on the web thickness rather than the Cohen grades. Endoscopic lysis and keel placement is only effective for cases with thin glottic webs. Patients with thick webs should be treated by other means. Jian Chen and Fang Shi share first authorship. This work was funded by grants from the Science and Technology Commission of Shanghai Municipality, China (No. 15401971600, 17411962000, and 16411960600).